This medley I created in 2005. It is a mash-up of some Donna along with a couple of other artists thrown in for good measure. I have created a lot of extra linking parts which help the clips move along smoothly. 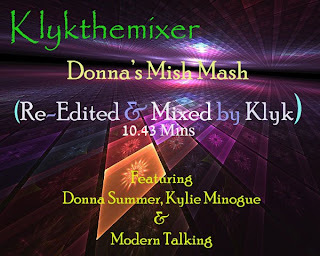 Kylie Minogue & Modern Talking Feature in this 10mins + mix. Thanks for all the great Donna remixes!! Keep them coming!! Regards from one Donna fan to another! like have u heard ya mo b there the jelly bean mix? I just Love is just a breath away great dance mix love it love it!!! Please leave a comment to the post. I like to read feedback from something I create.